I'm looking to draw some images with arbitrarily-located corners into an otherwise 2d game. My understanding is that one of the ways to do this is with quads. Examples of drawing quads exist, but I can't seem to find a good way to put them into 2d space without hours of messing around with numbers to get the scale and orientation right. ("right": I could line up the corners of my quad with the same coordinates of a rectangle drawn with spritebatch, and have all the edges match up perfectly.) Is anyone aware of a minimal example of this that I could use? Ok i just thought i re-edit this and post up a couple better examples that i am more satisfied with myself and for posterity's sake. Though there is still plenty of room to improve these they are pretty basic (look at the draw methods) with some extra stuff tossed in. They will be in two posts. The other will use a custom effect. The custom effect will also have a very basic effect file. The similarity will be that they will both for the most part, use the same draw code and that will just draw a textured vertice colored rectangle drawn in two different ways. This is done either with DrawUserIndexedPrimitives or DrawPrimitives. How you can switch the winding or culling direction fairly easily. How you can scroll around your world very easily with a view matrix. How you can generate a texture with setdata. That you can alter each individual vertices color and shade it. 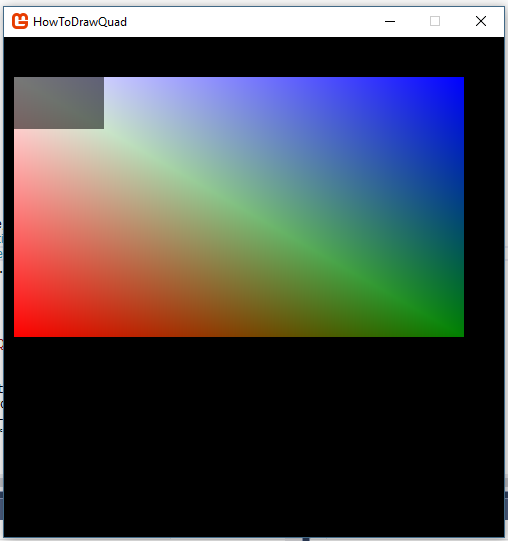 A basic VertexPositionColorTexture shader as well. There is some start up code to show basic instancing at the bottom of each class as well though it really would need its own example as the way you use it properly isn't really shown. It shows a lot of stuff but ive compacted it down as most all of it goes hand in hand. I like to rename the Program.cs class so its up at the top of the solution explorer sometimes i put more then one game1 in there too. // set up our matrix to match basic effect. // We could set up the world maxtrix this way and get the expected rotation but its not really proper. This class is very similar to the above but uses a user made custom effect (shown at the botom) both output the same thing in the end. To run this one you will need to create the effect file with the same name and copy paste the effect in. The first example can just be all copy pasted in with the namespaces changed to your projects namespace. // We can set up the matrices this way to get the expected rotation but it is improper the view is the camera. The corresponding effect (.fx created with the pipeline tool). This goes with the above example. Thank you! I will try this at the nearest opportunity, and endeavor to report back once I have. I updated this with a couple better examples. For other people who might run across this or as a reference. Holy moly, man, you're awesome! Thank you. I've stared working with the first example, but haven't had the time to parse it fully yet. This weekend, I hope.